Opened in 2009, the Douro41 went through several incarnations before its original architect João Serodio was tapped to work on a spruce-up prior to its recent reopening. 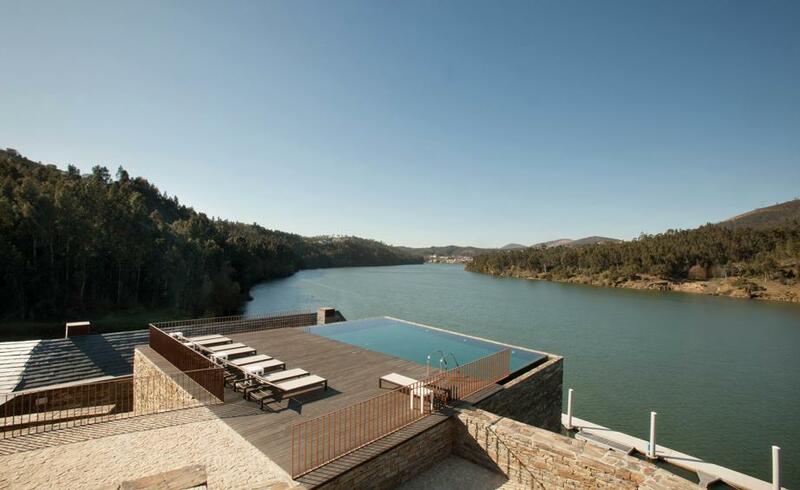 Taking nothing away from the Portuguese architect’s handsome plan of low slung sun-burnt brick buildings, the star attraction is the 62-room property’s setting – literally, on the edge of the Douro (the ‘41’ in the hotel’s name apparently references the river’s kilometre length) in the midst of the region’s fabled swathe of vineyards and tree-cloaked hills. Whether the timber deck of the al fresco pool, restaurant or spa, which also features an indoor lap pool, every vantage point in the resort opens out to that view. And as evening falls, Lisbon-based interior designer Cristina Jorge de Carvalho’s warm almost Nordic interiors of grey and slate hues, blond timber floors and austere furniture turn into a quiet, stylish retreat that leads directly to the dining room. Here, Ricardo Lourenço channels a lustrous career in some of Paris’s best kitchens – among them, Le Cinq, Ledoyen, and La Tour d’Argent – into a Gallic-influenced menu of reimagined Portuguese standards such as a goat’s cheese crème brulée paired with macerated grapes, and chestnut cream, and a crowd-pleaser of baby goat roasted in the wood oven with stuffed potatoes and onions.